** Disclosure: My associate Tauyna Blanco attended a prescreening of the film to facilitate this review. No monetary compensation was made and all opinions expressed are 100% her own. firefighting aircraft devoted to protecting historic Piston Peak National Park from raging wildfire. When world famous air racer Dusty (voice of Dane Cook) learns that his engine is damaged and he may never race again, he must shift gears and is launched into the world of aerial firefighting. Dusty joins forces with veteran fire-and-rescue helicopter Blade Ranger (voice of Ed Harris) and his courageous team, including spirited air tanker Dipper (voice of Julie Bowen), heavy-lift helicopter Windlifter (voice of Wes Studi), ex-military transport Cabbie (voice of Captain Dale Dye) and a lively bunch of brave all-terrain vehicles known as The Smokejumpers. Together, the fearless team battles a massive wildfire and Dusty learns what it takes to become a true hero. 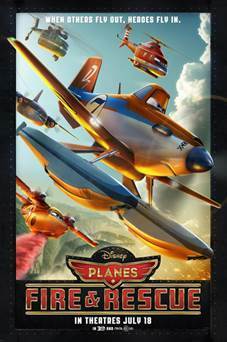 Directed by Bobs Gannaway (“Secret of the Wings”) and produced by Ferrell Barron (“The Fox and the Hound 2”), “Planes: Fire & Rescue” hits theaters in 3D on July 18, 2014. At the beginning of the movie I had my doubts if this is going to be a good sequel. It started off very slow and with adult humor that I didn’t think it needed to be in there. But as the movie continued I became pleasantly surprised. I love when a movie can get down to kid level of understanding. It was easy for my kids to see that sometimes life doesn’t always work out the way we want it to. But that doesn’t mean you still don’t have a big future ahead of you. Sometime your biggest failures become your highest achievement. The character development in the start the this movie wasn’t as good as it was the first Planes movie. However at the end you really started to love the characters and their no quit attitude. My children really enjoy the movie and wanted to see it again soon as it finished. My oldest daughter said “we have to buying that as soon as it comes out”. Though I still could do without all the adult humor that I think it’s inappropriate for the ages this movie Appeals to. It was still a great family movie and we would see it again. 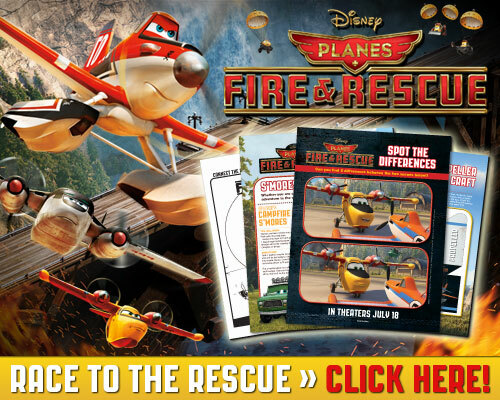 Disney’s PLANES FIRE AND RESCUE now in theaters!